Dr. Bouknight specializes in IVF, infertility treatment and reproductive surgery. She enjoys helping patients understand the cause of their infertility and guiding them to effective treatment. 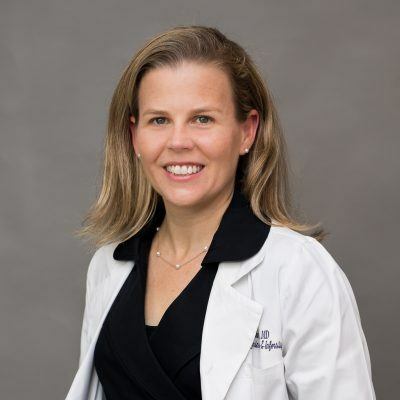 Dr. Bouknight earned her medical degree from Harvard Medical School and completed her residency in Obstetrics and Gynecology at the Brigham and Women’s Hospital and Massachusetts General Hospital combined training program. She completed her fellowship and a Master of Science degree in Clinical Epidemiology at the University of Pennsylvania. Raised in Hawaii, Dr. Bouknight moved to Alabama in 2010 to join the faculty at UAB where she directed the IVF and Fertility Preservation programs. Dr. Bouknight has received multiple patients’ choice awards and teaching awards during her medical career. She is an active member of the American Society of Reproductive Medicine, Society of Assisted Reproductive Technology, Society of Reproductive Surgeons and is a Fellow of the American Congress of Obstetricians and Gynecologist. Dr. Bouknight has multiple peer-reviewed research publications and serves as a reviewer for top reproductive journals including Fertility & Sterility, Obstetrics & Gynecology and the American Journal of Obstetrics & Gynecology. Dr. Bouknight welcomes patients with infertility, pelvic pain conditions or endocrine issues. She specializes in IVF, infertility treatment and reproductive surgery. She and her husband, Nathan, live in Birmingham and have two children. In her free time she enjoys running, cooking and golf.